This is the gist of the systemic presentation a sleep deprived introvert (moi) shared at the inaugural FutureMe event on March 25, 2016 at The Float@Marina Bay in Singapore. The “Age of Me” is Form (appearances based on scarcity) while the “Age of We” is Substance (inside us – knowledge, innate gifts and authenticity based on abundance). 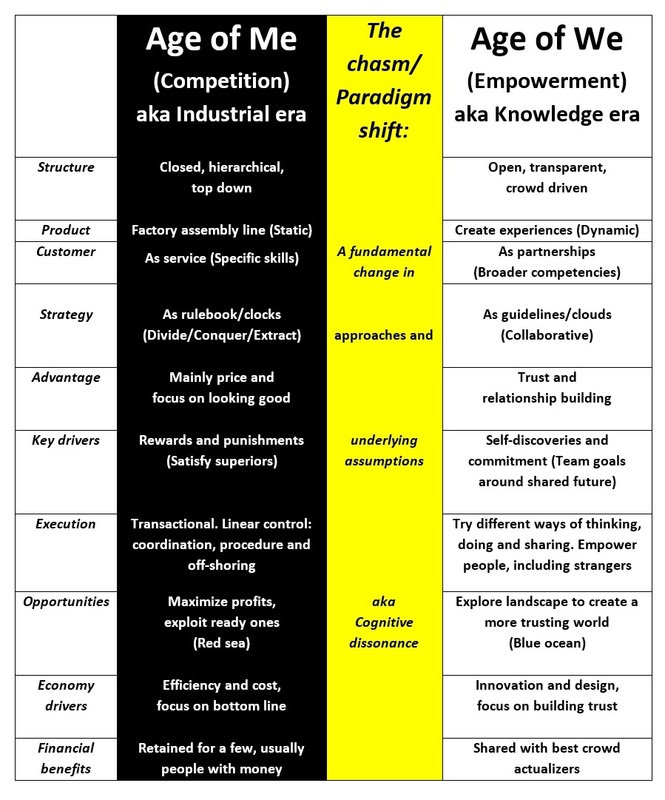 We’re in the exciting paradigm shift between these 2 vastly distinct (business) cultures: The competitive “Age of Me” that valued things for what they produced and the “Age of We” that values the application of knowledge through empowerment. In the “Age of Me”, businesses operate much like a factory assembly line because knowledge is hoarded. Everything is planned (sometimes blindly) from the top and executed by people in departments (usually working in haphazard silos). As firms create, push and sell stuff, value is produced upstream and consumed downstream. Because very few people benefit financially, owning hard assets is seen as a symbol of success. While the impact of technology maybe exponential, the “Age of Me” thinking tends to be linear: I was born, go to school, start my career, get married, start a family, etc etc. Factory assembly line thinking. But what if the next 20 years really changes humanity more than the last 300? Our future is highly unpredictable because the challenges are systemic. Should you choose to remain in the mega competitive Age of Me (yep, that’s also the choice you make for your children and their children), PLEASE remember it’s how a person with money hires a person without for the lowest possible wage to make as much profit as possible for the one with money. Already, automation, artificial intelligence and robotics are replacing many jobs. There are also too many reports saying most people globally will be jobless in X number of years. If very few people have jobs or just do gigs, how do we pay for living expenses like food, shelter, clothing, transportation, etc which keep getting more and more expensive? Some countries like Finland and New Zealand are looking into universal basic income where everyone will receive an unconditional sum of money regularly. To truly prepare for the “Age of We”, I believe we NEED to completely rethink everything and NOT use the same thinking we used when we created systemic problems like poverty and climate change. To get everyone’s best input, we will first need to co create an “Age of We” culture to empower strangers ANYWHERE to DARE trust one another. True abundance happens when each of us can openly apply our knowledge and our gifts to empower one another to be our best for everyone’s benefit. Instead of madly competing against another, the only person we try to be better than is the person we were yesterday. 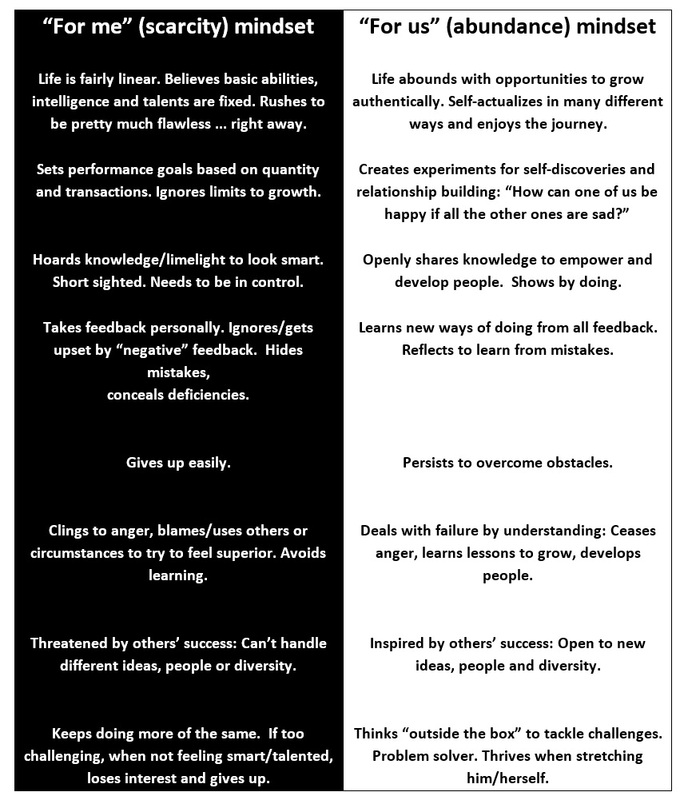 To go from Scarcity to Abundance, the world has to experience an authentic paradigm shift. Dare to self discover. Dare to experiment. Dare to unlearn to relearn. Start by openly enabling strangers ANYWHERE in the world to openly build trust with one another. You’re MOST welcome to build on our social experiment. As we don’t even have our own central engagement platform, please like our page on Facebook. With your participation, this is the “For us” maximization movement I hope to start about a new way of thinking, doing and sharing. May our potentials as an authentic human being become visible very soon.